Um, hi. We’re doing this. I feel like this is a post for Monday because CAFFEINE but this is also a post for the weekend because it’s heaven in a cup that you can sit and enjoy while you read the paper. And by “read the paper,” I mean scroll through your instagram and snapchat and newsroom app updates. You know, the 2016 paper. My mom still reads the paper though. She might be the only one. Can I just shout from the rooftops how freaking in LOVE I am with this drink-breakfast hybrid?! And oatmeal isn’t even my… thing. 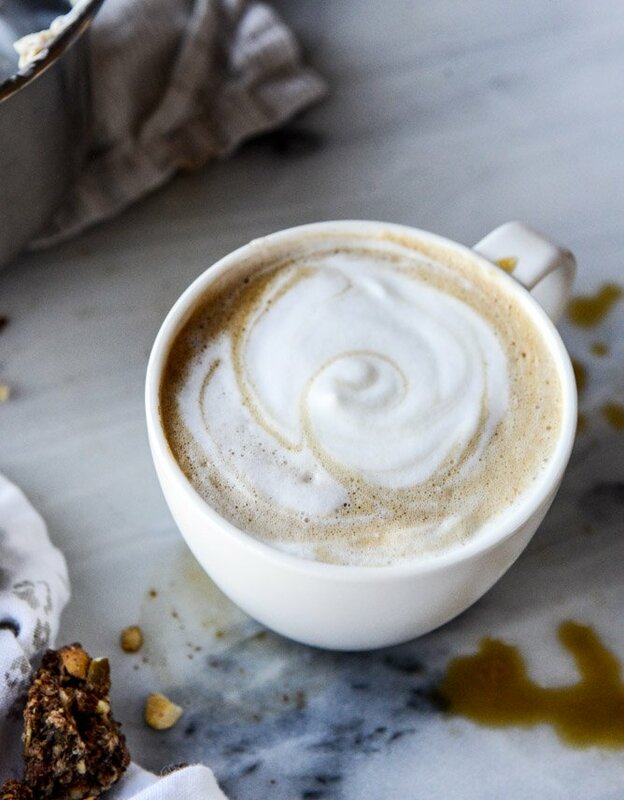 From the moment I saw this oatmeal latte – an article written on bon appetite – late last summer, I was dyyying to make it. Seriously, it’s been on my list for at least six months and I’ve considered it every single week. Finally, we’re doing it. It’s a hug in a mug. 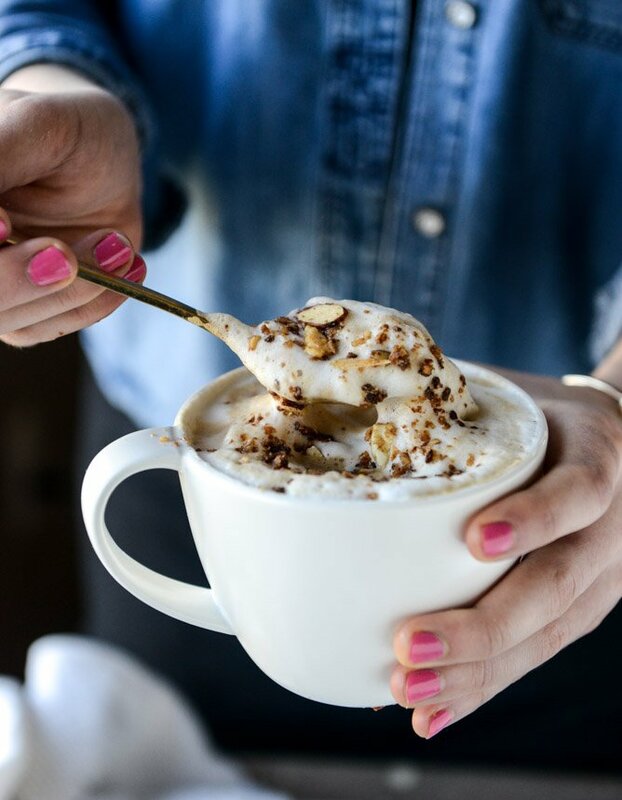 First, I love the reactions to the oatmeal latte – the “should I sip or scoop” – because apparently the answer is both! And it totally is. 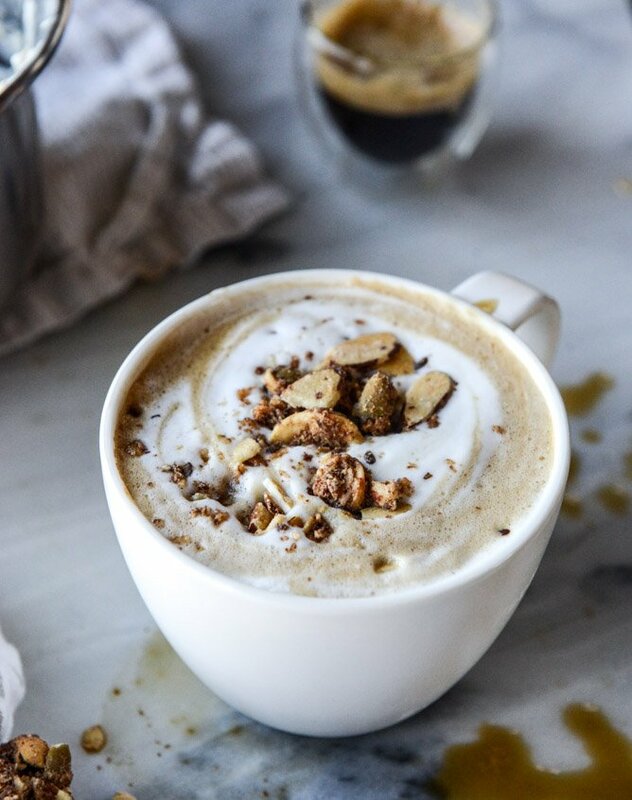 It’s a caffeine boost with brown sugar oatmeal and if you’re a breakfast lover, it might be everything you’ve ever wanted. You whip rolled oats with some steamed milk and brown sugar. And salt! A little touch of salt. Salt is key here. 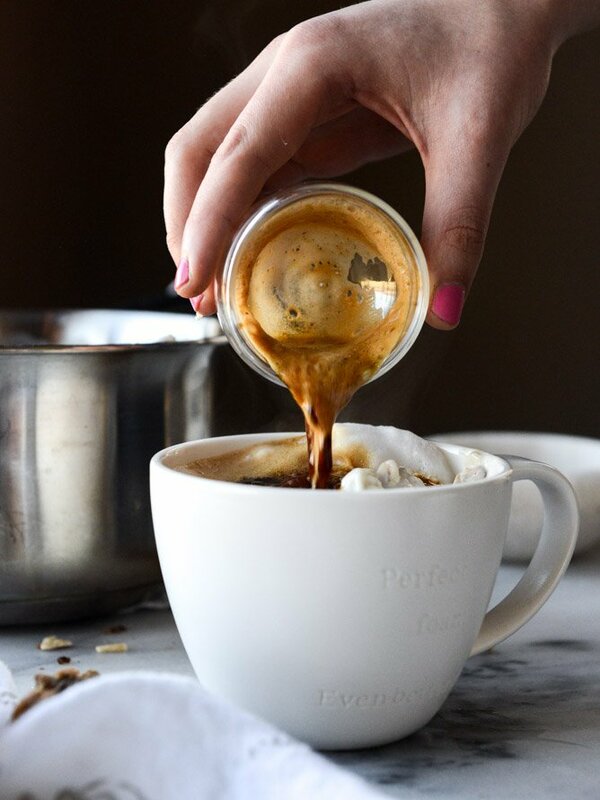 Scoop it into your mug and hit it with a shot (or two) (or three) of espresso. aka, life blood. 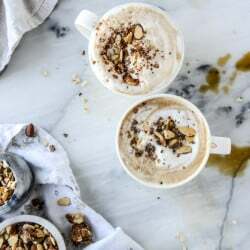 The whole thing mixes together and it LOOKS like a drink, and it sort of is – you can certainly sip it to get that first morning jolt. But it’s best consumed with a spoon, so you get bites of brown sugary oatmeal and creamy milk and coffee. The whole thing is topped with a sprinkling of granola which may sound weird, but it’s not granola sitting on straight liquid. Obviously. It’s like crunchy granola on top of your cappuccino-flavored oatmeal. I used this maple nut crunch granola from Nicole and it was to die for. It has cashews! 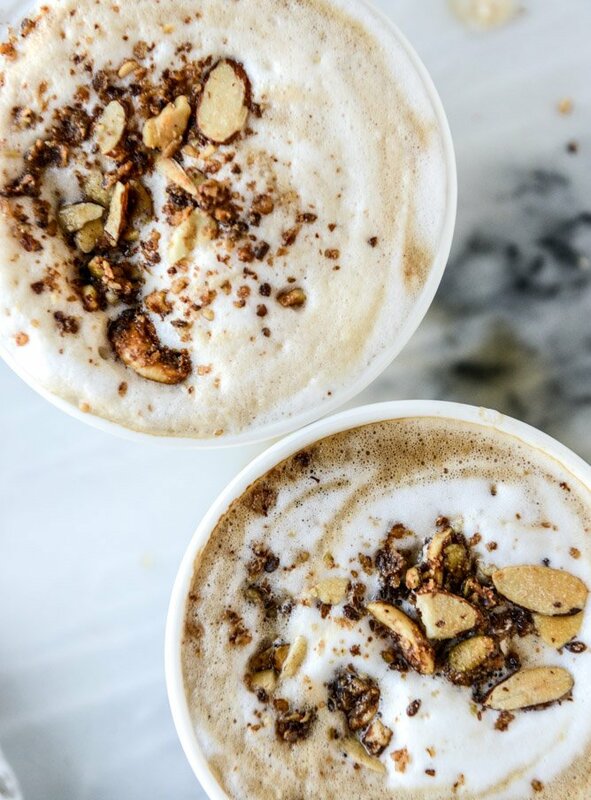 It’s the most addictive thing ever, right next to this oatmeal latte. Which is probably why I paired them together. You neeeed to try this if you love coffee and oatmeal. You can adjust the flavors accordingly – do you like more or less sweetness in your breakfast? Do you drink espresso shots or prefer lattes? Heck, make it into a Starbucks-version with tons of hazelnut syrup. 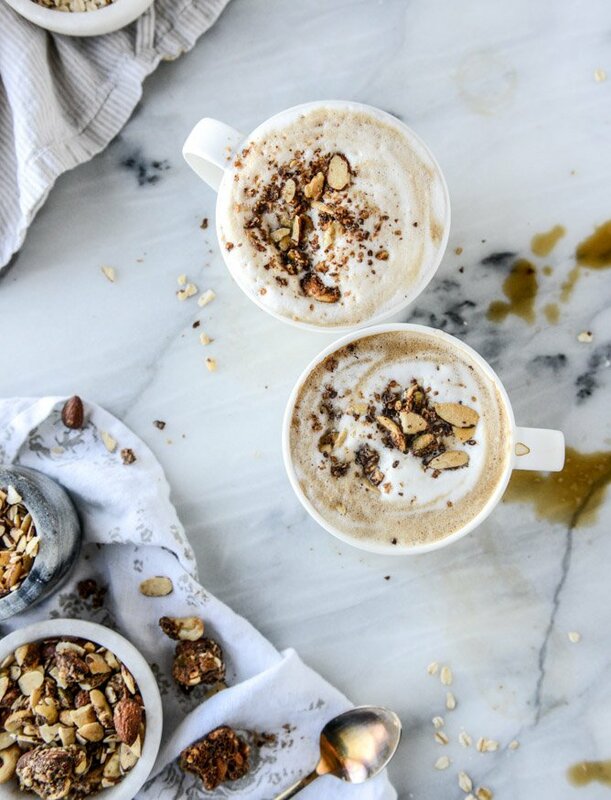 It make take a time or two to figure out YOUR perfect oatmeal latte combo but it’s 1. worth it and 2. definitely worth it since you can eat all the first (couple of) tries. Now I’m going to drink one of these and tell you how much I love you. Sometimes caffeine makes me feel drunk. Eating this now and may I just say, it is mighty delicious. Made this today and LOVED it. It truely is breakfast perfection and is gonna compete with my regular chocolate peanut butter oatmeal, which means a lot! Haha. Thanks for the great recipe. this truly is fascinating. I had a thought. What about pureeing the oatmeal and espresso together first? So it’s more drinkable? 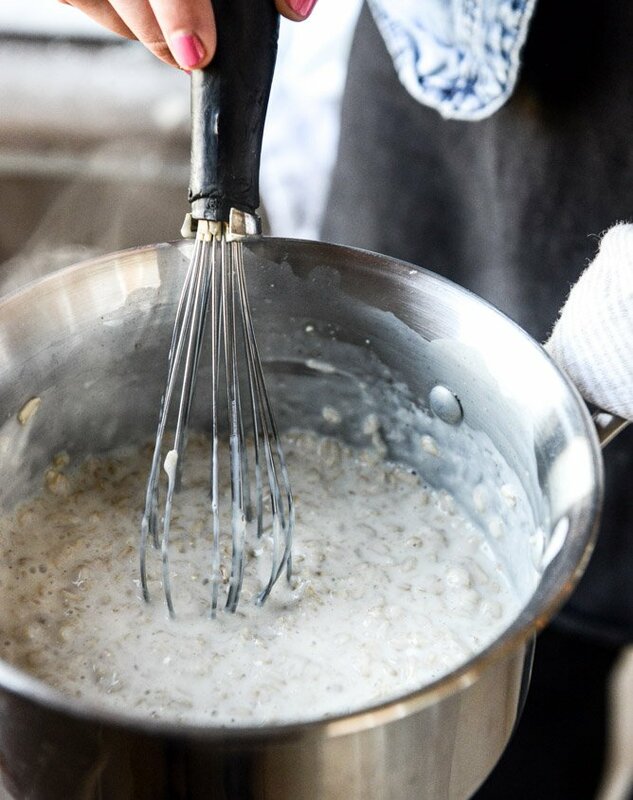 Maybe I should just make and try it, but it seems odd to eat oatmeal submerged in coffee….. Love the video!